If you’re going to ride an aero road bike, you must resign yourself to certain inconveniences. For one thing, you cannot run your stem angled upwards. If you can’t ride slam-low, you’ve no business throwing a leg over such a bike. That’s like wearing water wings and a Speedo. 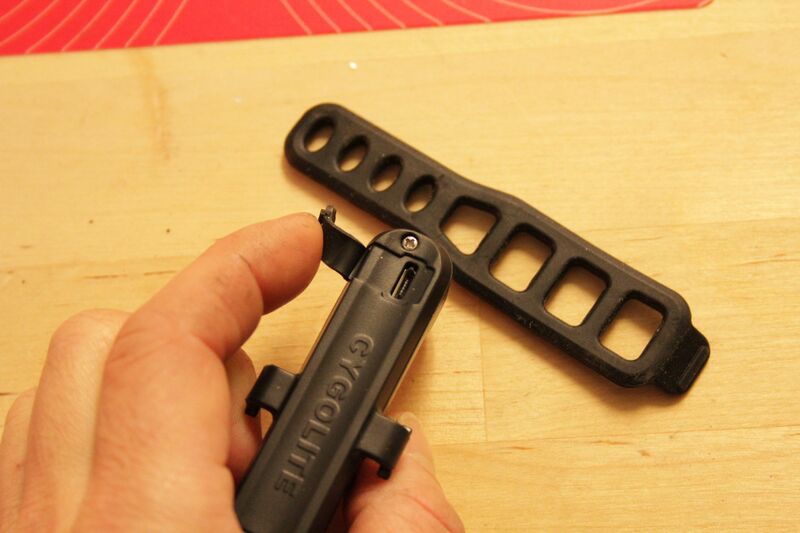 Another issue is that anything you might want to attach to your bladed seatpost is going to be a hassle. 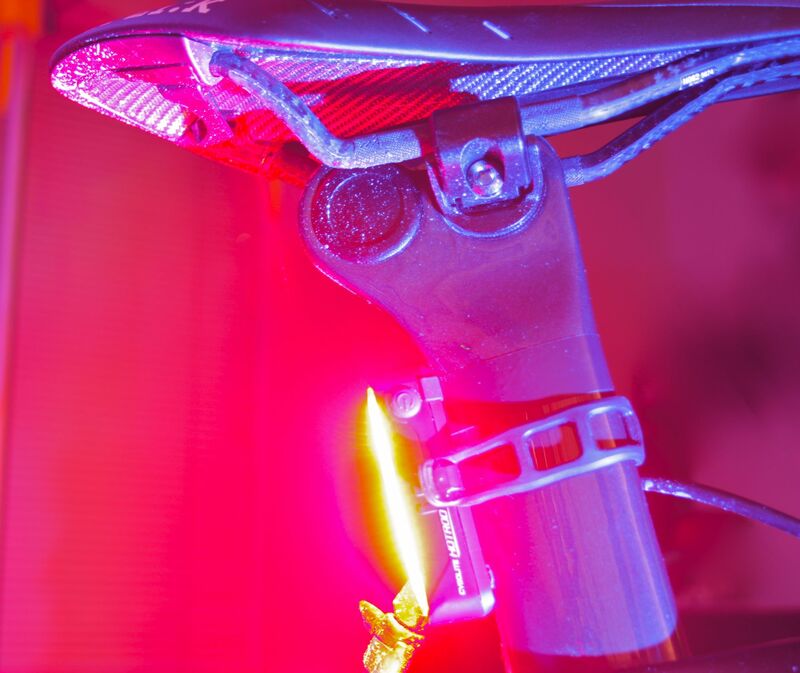 And the only thing you are allowed to put on your seatpost is a tail light. The problem is that the bladed seatposts/seatmasts that many aero road and triathlon bikes sport don’t provide an ideal shape for the common tail light to grab. A second issue is that tail lights ruin the aesthetics….errrr, aerodynamics…of your pricey rolling carbon sculpture. Hold on a moment, and I’ll try to solve these two problems at once. First up I’ll give this Cygolite Hotrod 50 a chance. The Hotrod definitely scores the full point on form. A slender, clean design, this little bon bon looks like the little black cocktail dress of bike lights. 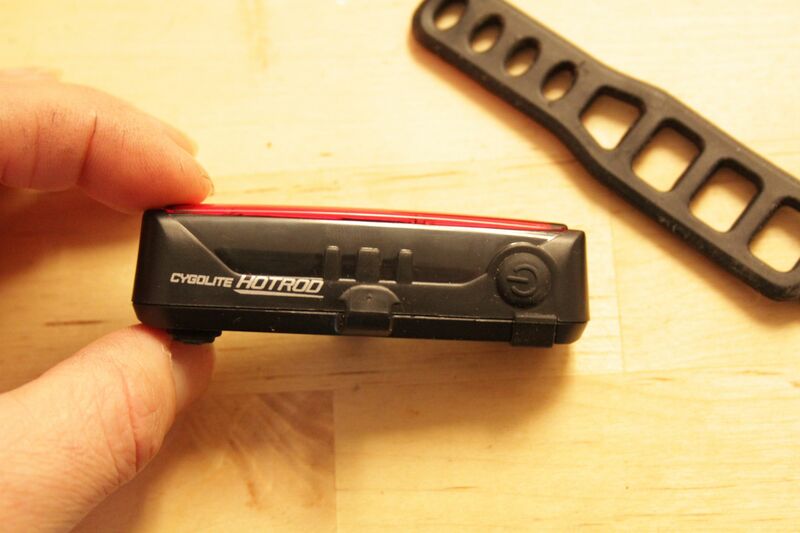 Like all the better lights in recent years, the Hotrod 50 is USB-rechargeable. Now that li-ion integrated batteries have come so far, really powerful yet long-lasting tail lights can be made surprisingly small by eliminating the accessible battery compartments that were necessary for the previous generation of lights. 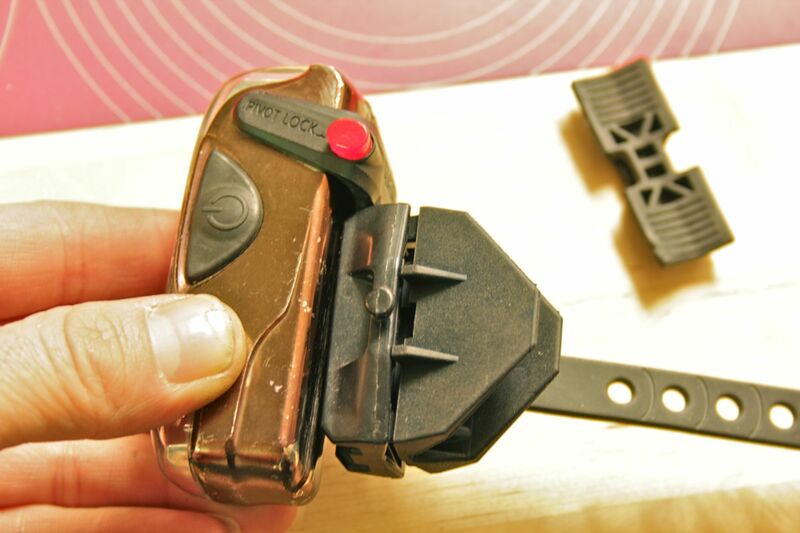 Since waterproofing is a prerequisite for bike lights, it is much easier to seal a mini-USB port too. 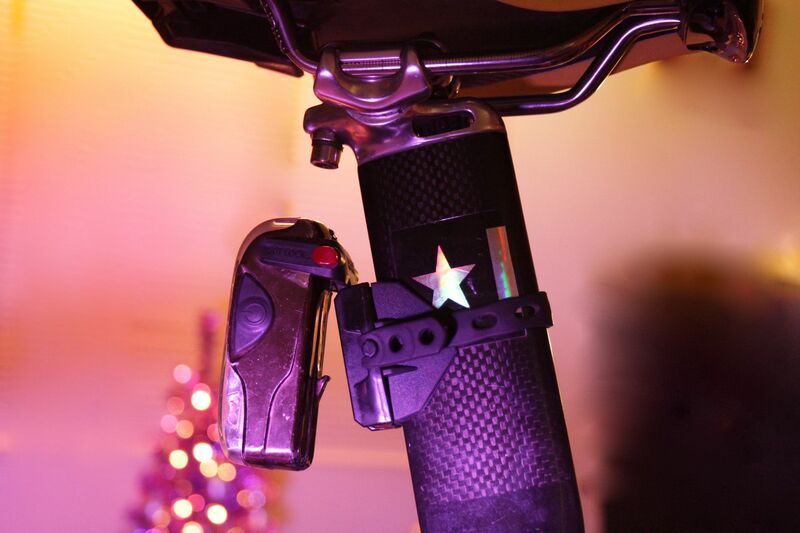 The Hotrod hides the charge port on the back side of the light, so when you strap the light to a bike appendage the charge port is partially held closed by being squeezed between the light and bike. The $37 Hotrod 50 weighs 29gr and takes 3hrs to charge. From that little package, you get 3.5hrs at full power flash (50 lumens), 1.5hrs steady, and 30hrs on low flash. It also has a “group steady pulse”, a low intensity setting suitable for use within a group, that lasts up to 100hrs. However, as a tail light for aero-shaped seatposts, the Cygolite misses the bullseye. 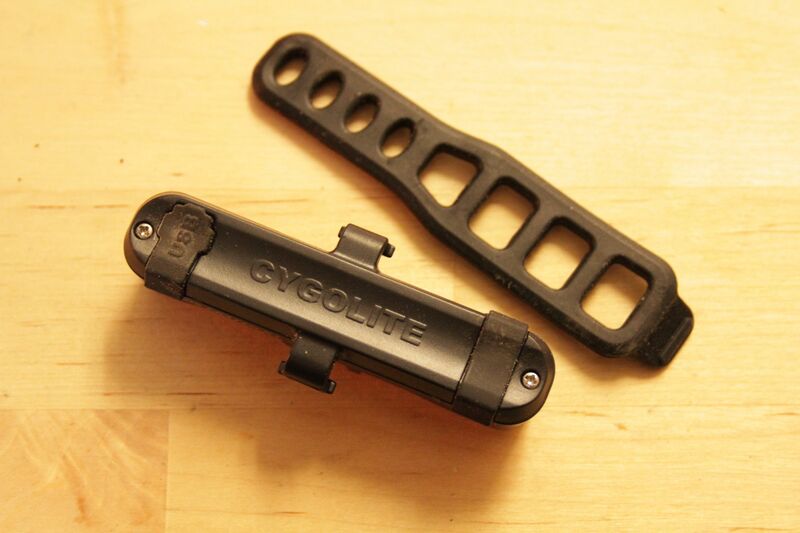 The rubber strap is a little too short for some bladed seatposts, and the back side of the casing, while narrow, is still flat with only a hint of concavity. On the sharp trailing edge of a bladed post, the Cygolite looks great for a moment but simply won’t stay in position for long before it pops askew. And when it does, the charge port cover can peel open as the Hotrod slides sideways on the post, looking like Goodwill handbag hanging awkwardly off a super model. On some Kamm-tailed seatposts like on Trek Speed Concept/Madone or Scott Foil bikes, the flattened back edge of those posts present less of a challenge to the Hotrod 50 (assuming that the strap is long enough). But then, who cares?… the market doesn’t lack for tail light products that can do the same thing. One thing that the Hotrod does do well is fit on really narrow, round cross sections, such as uber skinny seatstays and the tubes of racks. The slim casing and light weight benefit here. But then we wouldn’t be talking about aero road and triathlon bikes, would we? Oh yeah, I forgot to mention before that you’re not allowed to even think about putting a rear rack on those bikes. There are laws against such attrocities. 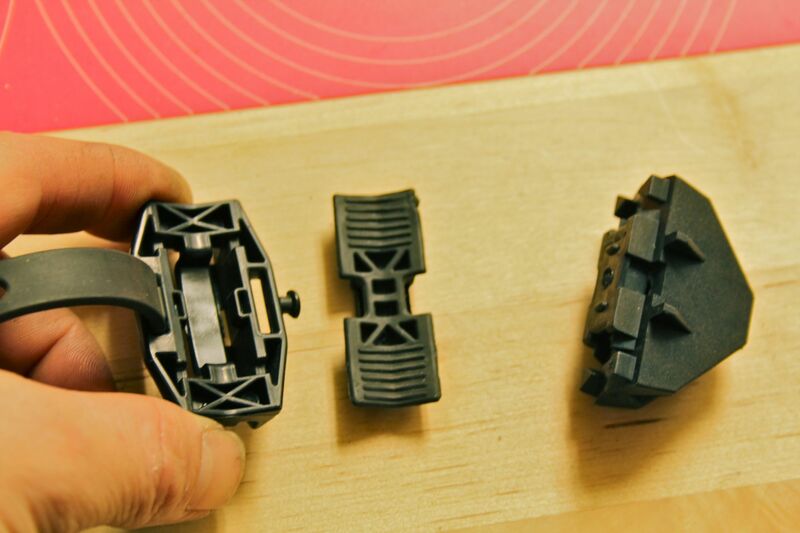 Light & Motion uses an alternate method to make their product fit an aero seatpost. Their Vis180 tail light has been out there on the market for several years now. At the time of its introduction, it was a leading edge product among USB-chargeable tail lights, but honestly the design suffers in comparison to newer tail lighs. In fact, compared to L&M’s relentless improvement and aggressive pricing of their Urban-series headlights, their tail light development seems a little stale. At 102gr and $100 retail, the Vis180 (70 lumens) seems bulky and expensive, though that is at least partially related to US manufacturing and the durable, aluminium casing. No surprise then that I have owned the same Vis180 for at least 4 years, and it keeps going like a champion. 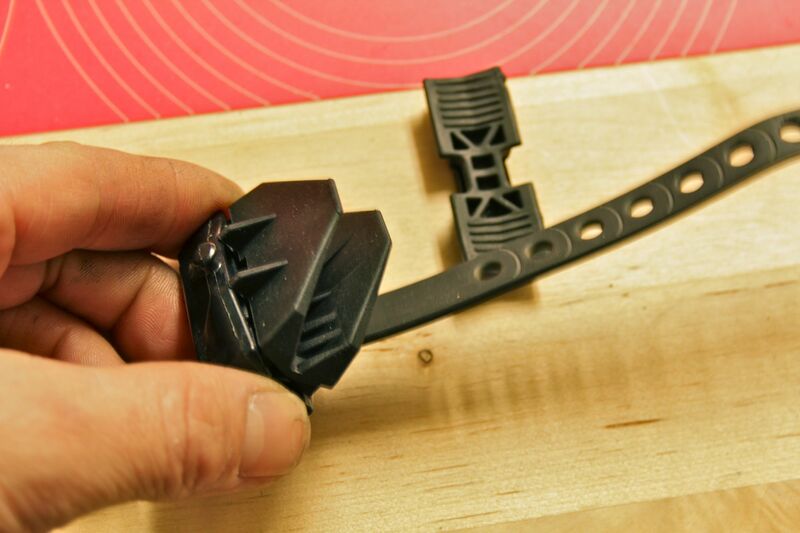 The Vis180 by itself is even less suited to aero cross sections, but L&M sells a $10 aero seatpost bracket as a add-on solution. 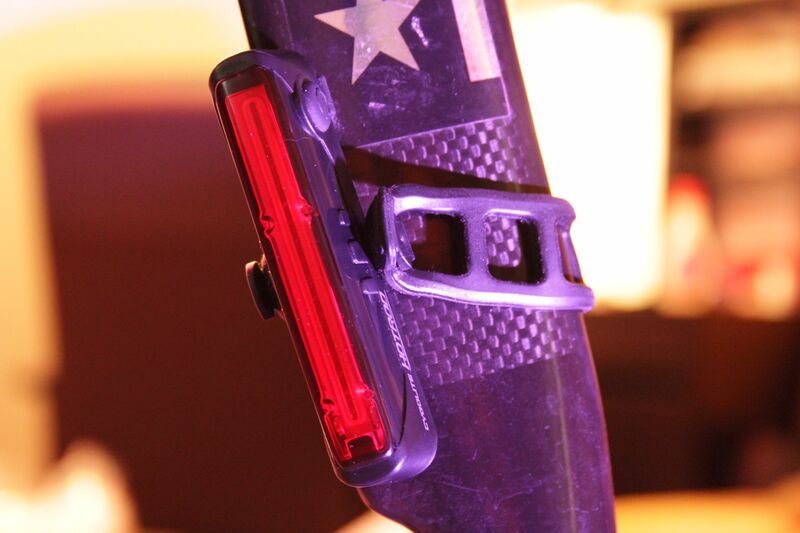 The bracket is a simple rubber block with a deep V-shaped groove moulded into one side, and you just stick the bracket between the light and post, resulting in a secure position on your aero seatpost for this decidedly non-aero tail light. A very practical solution that nonetheless offends the eye, but it will have to do.